In 2019 ILG has a BHAG (big hairy audacious goal): Influence organizations to build proactive workplace cultures that enhance the employee experience and accelerate business productivity. A focus on culture will reduce workplace conflict and can revolutionize business with an important side effect – getting results (Check out Christie Lindor’s Blog: “People do not quit companies, managers or leaders – they quit organizational cultures. Here’s why.” https://christielindor.blogspot.com/2017/10/people-do-not-quit-companies-managers.html). In theory, this seems to be a no brainer…. but achieving it requires substantial focus and determination as leaders must turn their backs on traditional, reactionary practices and step into a new landscape where accountability and humanity work hand in hand. Humanity: According to Miriam Webster, humanity is defined as: compassionate, sympathetic, or generous behavior or disposition. Humanity has been a hot topic recently with the #MeToo movement and unprecedented EEOC complaints in 2018, prompting research around what drives organizational discontent and discourse. It is commonly said that people don’t sue a company because a law has been broken or policy implicated. More often than not, people sue because they were treated poorly, dismissed, invisible, or shunned – not treated with common decency and respect. Most people don’t want to sue their employer, they want something to stop (or start)– inappropriate behavior by their manager, company discriminatory practices or unethical behavior of a senior partner. When concerns are reported and the employee is not treated in a respectful (or humane) manner, the gloves can come off. Recently SHRM published an article “Putting the Humanity in HR Compliance: Defending Claims” by Jathan Janove, JD, in which Mr. Janove highlights the importance of humanity especially when the stakes are high. When the stakes are high, or there are no stakes at all, remember that people are watching you as a leader. Your behavior and your comments have a ripple effect throughout the company. If you practice the company values and call out those who are not, the tone is set for a respectful workplace. When you aren’t the role model for the stated values, your behavior becomes the default that will be emulated in the company, and dysfunction follows. Compassion: Sprinkling in compassion with humanity is a recipe for success. All employees are balancing life when they make their way to the office: kids to drop off, bills to pay, weddings to plan, ailing parents to care for, and countless other distractions that can impact productivity and focus. Sometimes there are additional stressors at work that compound the effect, like an abusive manager. Studies show that less than 25% of workplace harassment is reported to employers. There are a variety of reasons for this, but a common theme is a fear of retaliation (which is real) and the desire not to make waves at work. This reluctance accentuates the need for leaders to be compassionate when complaints or concerns are brought forward. It takes courage and vulnerability to speak up and that should be rewarded. Complaints that are met with a compassionate response have a higher likelihood of being resolved quickly and in a balanced manner. It’s okay to say: “I know it must be difficult for you to report this to me, thank you for giving me an opportunity to help.” You haven’t admitted guilt, what lawyers warn against, you’re showing compassion which will go a long way when you’re addressing the complaint. Compassion practiced in your daily communication will have a positive impact on the workplace. Don’t be afraid to make exceptions. In my Human Resources career there were times when we made exceptions to policy when an employee had a tragic life event. When questioned about the decision, I confidently informed management that exceptions breed loyalty. Employees don’t want to work for a company that follows policy regardless of circumstances, they want to work for a company that understands the human experience and are compassionate and flexible when life takes an unexpected turn. What’s the worst that can happen? Maintaining business as usual when it is NOT, creates an environment that can breed resentment. Compassion goes a long way to cultural transformation – give it a shot. Active Listening: Successful business leaders have a keen focus on listening to their clients, bankers and business partners. Practice this art when talking to employees at all levels of the company. Whether it is a casual conversation, a business meeting, or a complaint that has landed at your office door, active listening is critical to take the pulse of the company and quickly identify opportunities to correct deficiencies and improve productivity. If you’re on the road for work, consider holding informal town hall meetings or round table Q&As as skip-level assessments of the culture. Be curious! Part of active listening is being inquisitive – if you think the employee is using “code words” to give you important information, ask them the “next” question. The bigger the power differential in the conversation, the more important it is that the leader is open, curious and seeks clarification to get the whole story. It is always disappointing when a complaint is raised, or a top performer leaves, and a leader says (or thinks) “Geez, if I had just listened a little better, or asked one more question, we wouldn’t be in this position.” Listening is a great way to show respect and make sure everyone has a voice. Not a lot to ask! Accountability: Finally, imbedding accountability into your culture accelerates goal achievement and can bring the team together (…thanks Captain Obvious). Have high expectations of everyone on the team to deliver excellence AND role model values. Steven Covey held that a balance of Character and Competence are “two essentials to building and maintaining trust.” As leaders, we need to hire people who can get the job done (competence) and emulate the values of the company (character). There isn’t a one size fits all way to practice accountability, as it must reflect the culture of the company. In general, accountability should reflect a responsible management of resources to ensure the most benefit to the mission and vision, well-articulated goals and frequent reminders on achievement and individual roles and responsibilities to achieve the goals. How does this look based on industry? Examples include: In a non-profit food bank, leadership would communicate the percent of donations used to administer the service, goals around how many families should be served each year, and then individual goals around efficiency and delivery of services. These are three easy metrics to highlight and align the team. A medical device company would emphasize the need to invest in research and development to stay on the cutting edge of the industry. This translates into clear objectives around sales to fuel R&D, quality and efficiency in the production of the device, and hiring and HR practices to attract top performers in the field. Couple these communication practices with rewards for modeling the values to maximize engagement. In our world of investigations, we see the challenges organizations face when a “Super Star Harasser” has been reported. Super Stars are the rainmaker, the thought leader, or the founder of the company. When companies choose not to address bad behavior, the culture suffers, and as we’ve seen in the past year, they risk public scrutiny. 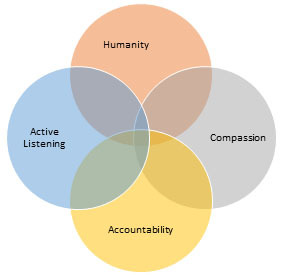 I contend that if leaders practice humanity, compassion, active listening and ensure their team is accountable to both goal achievement and role modeling values, Super Star and less high-profile harassers will be stopped in their tracks. Let’s make 2019 the year of #GREATCULTURES!